There are 10 pieces in this group of patterns. 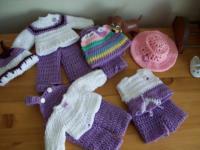 The set consists of 4 pants styles and 4 tops to go with them. 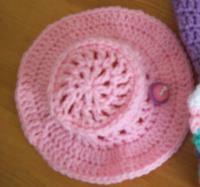 It also includes one summer sun hat just for fun and a winter hat for warmth. I used Red Heart WW yarn and hooks varied from a 5.mm hook to a 6.5mm hook. The Pants Variations… I will give the instructions for the various leg styles first and then give the ‘torso portion’ instructions at the end. The Coveralls are made differently so they get their own spot. The pants are made by making the 2 legs that are then joined. Only the Capri’s require that you break off after making both legs. Rows 1-3: Work dc evenly around. Do not break off after 2nd leg. Go to Torso Instructions. Row 2: dc in each dc. Rows 4-7: work evenly in dc. Break off and tidy all ends. Align the two legs with the flaps to the outside. Go to Torso Instructions. Your rows begin and end at Centre Front. T Row 1: Align the two legs and join with 6 sc, ch 1. Begin working in dc around the leg sections, Put the first dc in the same stitch as the sc join. It might be helpful here to go to the back to Mark out your increase stitches. Put markers in the stitches that are 5 from the Centre Back join on each side. Row T2-T3: work evenly in dc. Switch to 5.mm hook if you wish at this point. Row T5: work dc but work 1 decrease on each side of back (2 decreases). Row T6: work a row of sc around an elastic waistband. Join. Break off and tidy all ends. The Coveralls…Do not break off after 2nd leg. 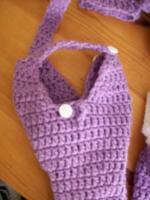 With Mauve and 5.5mm hook, ch 19 and join. Row 1: dc in each chain, join. Dc to your first marker… work [2dc, ch 1 2dc, ch 1, 2dc] in the five stitches, work 3 TR into the CB join, work [ ] again then continue in dc to beginning of row being sure to put stitch in sc-joined stitch on this side, join. Rows T2-T4: Work evenly in dc. Flatten the pants and locate the 11th stitch from CF on both sides and place markers. 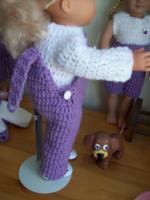 Pattern Stitch: Button Loop Cluster- this is a FP-Dtr and a dc worked together. YO 3 times, yo and pull up a lp,(yo and draw through 2 lps on hook) 3 times (2 loops still on hook) YO and begin dc in 11th stitch finish by pulling loop through 3 loops on hook. Row T5: work in dc with Button loop clusters in the two marked stitches. Join at end of row and break off yarn. 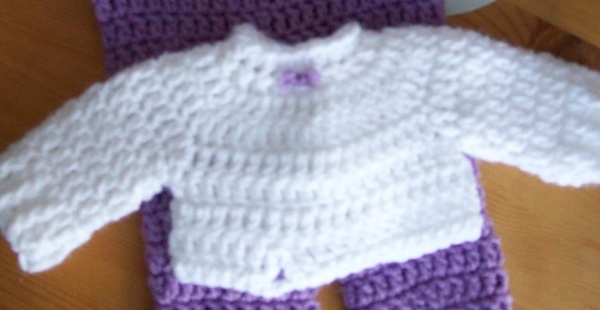 Attach yarn as indicated and ch 3, Work dc dec in next, dc to last 3 stitches, work another dec, dc in last stitch. Row 2: work decreases as for row 1. Rows 3-5: hdc dec in first and last stitch, dc for the rest..
For front break off yarn and tidy all ends. For the back, begin straps. Strap: work sc in 1st stitch, hdc in next 2 st. ch 1 and turn. Work as many rows of 3 hdc as you need to make your strap reach to the front comfortably. I would recommend that you measure your straps with a top under it. Last row… ch 6 tightly and attach to other end with a sc. Break off and tidy all ends. Make a second strap at the other edge the same way. 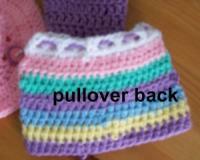 Add buttons to front bib and at sides near the Button Loop Clusters. Only one button loop is included in the instructions but remember to work some form of closure or plan to buy soft Velcro ™. Hdc in 6, ch1, hdc in 8, ch1,hdc in 12, ch1, hdc in 8, ch1, hdc in6. Either Secure white and don’t break off or just Break off if you prefer that. Row 6: with mauve, hdc in 6, [hdc, ch1, hdc] in ch1 space, hdc in 8, [hdc, ch1, hdc] in ch1 space, hdc in 12, [hdc, ch1, hdc] in ch1 space, hdc in 8, [hdc, ch1, hdc] in ch1 space, hdc in 6. Secure mauve but DNBO. Row 7: with purple … hdc in 7, [hdc, ch1, hdc] in ch1 space, hdc in 10, [hdc, ch1, hdc] in ch1 space, hdc in 114, [hdc, ch1, hdc] in ch1 space, hdc in 10, [hdc, ch1, hdc] in ch1 space, hdc in 7. Break off purple. Row 8: pick up mauve again… hdc in 8, [hdc, ch1, hdc] in ch1 space, hdc in 12, [hdc, ch1, hdc] in ch1 space, hdc in 16, [hdc, ch1, hdc] in ch1 space, hdc in 12, [hdc, ch1, hdc] in ch1 space, hdc in 8. Break off mauve. Row 9: with White…hdc up to and into the 1st ch1 space, ch1, skip to next ch1 space, hdc up to and into the next ch1 space, ch1, skip to next ch1 space, hdc in next ch1 space and to end. Sets the bodice and sleeves apart. Row 13: work in hdc but work 4 increases… one in each back section and 2 in the front. Row 16: hdc in 1, FPdc in next across the row. Row 17: hdc in 1, BPdc in next across the row. Sleeves: attach yarn in underarm and work around the sleeve opening. I use sc in the underarm and hdc for the rest for at least 3 rows. You may need to decrease occasionally to make a nicely formed sleeve. Make the sleeves as long as you wish and finish with FP/BP ribbing if you like that look. When spring does finally come we like our clothing to reflect the wonderful flowers that are springing up around us and this top does that. Use any colours you have on hand to go with your main colour. 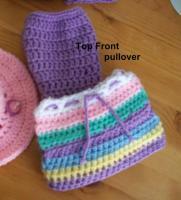 The top is worked in two rows of each colour. The instructions will not tell you to change colours each time though. With white and 5.5mm hook… ch 40 and join without twisting. Row 1: ch1, hdc in same stitch, *ch1, sk1, hdc in next* to end of row and join. Divide now for armholes… you have 40 stitches and you will not use 2 of those to leave the openings. 38/2 = 19 stitches for front and back. 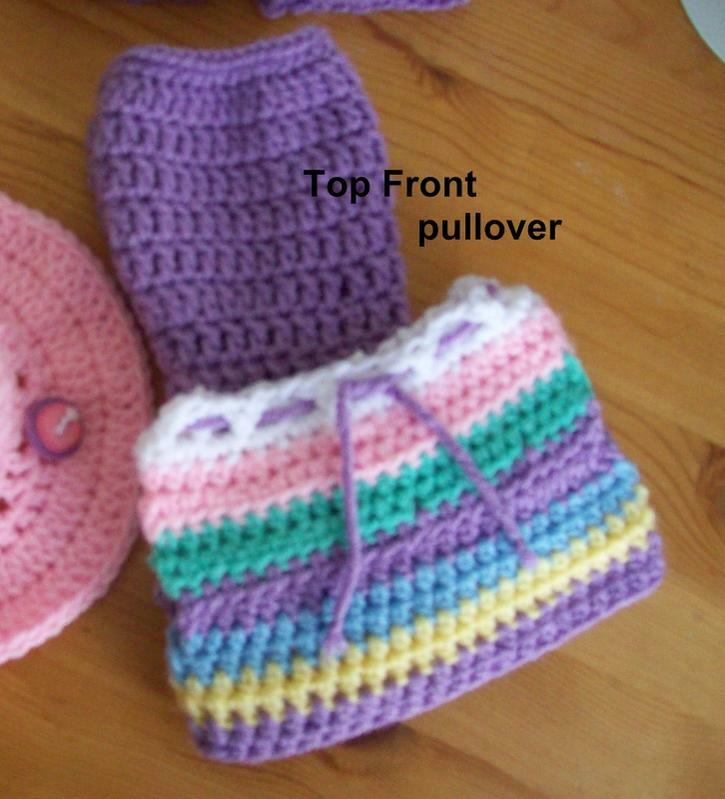 Front Rows 3-8: remembering to change colours after every two rows, work evenly over the 19 stitches. Back Rows 3-8… as for Front rows. Row 9: Hdc across back, ch1, hdc across front, ch1 hdc to beginning and join. Rows 10 – 14: continue working evenly in hdc changing colours as needed. Break off and tidy all ends. 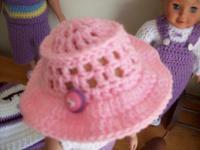 Create a fine cord to tie through ch1 mesh of first row to bring neckline in to body. It begins with the triangle motif that you see. The strands for the beading were just my starting tails: I figured it was easier to use them than to try to tuck them into the motif. 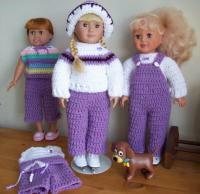 With mauve: Ch3, 2dc in 3rd ch from hook, ch1, 3dc in 3rd ch from hook. Shell formed… secure mauve. Row M2: attach white at beginning side. Work a dc in every dc and [3dc, ch1, 3dc] in the ch 1 space. Break off white. Row M3: pick up the mauve and work a SC in every DC, [sc, ch1, sc] in the ch1 space and sc in each dc down other side, ch 18. The ch 18 forms the left side of your sweater. Being careful to keep your chain untwisted, hdc in 2nd ch from hook and in each ch to the motif. Join to motif with sl st. Sl st to next level and work hdc to end. Continue it this manner until you get to the top of the motif. work a [sc, ch1, sc] into the ch1 space at the top of the motif and then sc down the side of the motif. Ch 11 to form the right side. Work in hdc as for the left portion. Break off mauve. Attach white at Centre Back and work evenly in hdc for 2 rows. I have 36 stitches at this point and that determined how many stitches for each part. I wanted to leave 4 open stitches for armholes so 36 – 8 = 28. Divide that in two and you get 14 so the front gets 14 and the backs get 7 each. If you have an extra or are short one… play with it to see what works. Back: work evenly in hdc for 4 rows. You should be at CB at this point and not at the sleeve side. -> sc in 1 hdc in 3. (this assumes that you are at the sleeve edge when you star the row. You want the sc to be at the armhole side) Break off leaving a long enough tail for sewing your shoulder seam and tucking away your ends. Front: work evenly in hdc for 5 rows. Attach the yarn in the 4th st from end to be worked and mirror the shoulder part you just did. 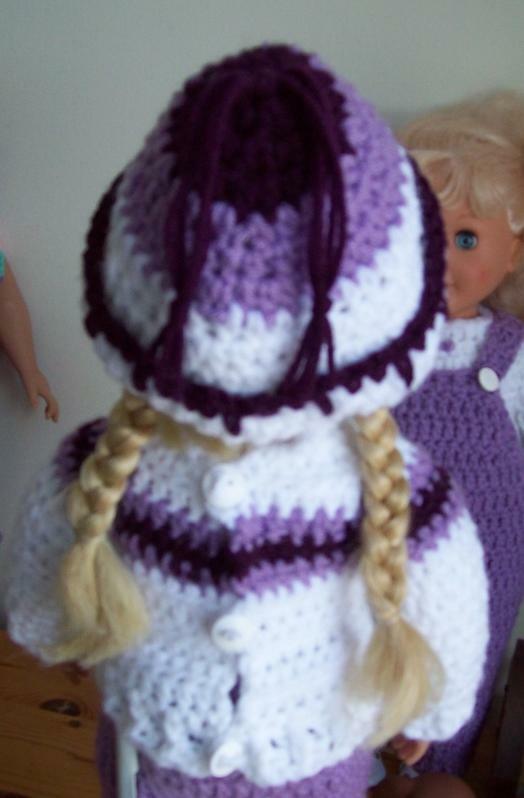 Attach yarn and make other back to mirror the first back part. Break off leaving a long enough tail for sewing your shoulder. Sew the shoulder seams and work 2 rows of hdc around the armholes. I work sc in the underarm. Add bead trims as you wish. Buttons might work for this as well and I love my buttons… oh yeah! This is a rather plain sweater but still has a dash of panache just for fun. The designer V-stitch is lost inside the overalls but we all tend to mix and match all our stuff so yah never know what this might just ‘go with’ another time. Row 2: sc in ea hdc. Row 4: DC in every FPsc. Row 6: dc in 9, ch1, sk 10, dc in 8 ch1, dc in 18, ch1, sk 10, dc in 9. Row 7&8: Dc evenly across. Row 9: dc in 14, Tr in next, ch4 sl st in next st, ch 4, Tr in next, dc to end. Row 10: SC in each stitch up to the ch 4, sc into top of ch 4, ch3, sc in top of next ch4, sc in each stitch to end. Tie 2 strands of mauve yarn at throat for trim if you wish. Sleeves: attach yarn in underarm and work around the sleeve opening. I use sc in the underarm then a couple of hdc next and dc for the top sts for at least 3 rows. You may need to decrease occasionally to make a nicely formed sleeve. Work as many rows as you wish for your sleeves. You may want to add a ribbing stitch to the bottom. I didn’t for this sweater because I had used it on the Winter one. Worked in 3 colours of WW yarn to match Fairisle sweater. This hat is generously made and I did have to thread some elastic thread through the brim section to rein it in but I wanted that generous look for mine. You might want a smaller hook and I think it will still fit. Work *sc in 2, long sc in next* around join and break off. Tidy all ends. Row 5: Work a dc/ch 1 mesh around the row. Row 6: you are going to work 2 dc/ch1 around the hat. Work in whatever st you come to to get your pattern as you see in the picture. Row 7: sc in every dc and ch 1 space. Row 8: Work 2 FPsc in every sc. Rows 9-10: Work evenly in dc. Break off and tidy all ends. I do not have a problem with people/groups using my patterns to make a little extra money by physically making them and selling the items they make. 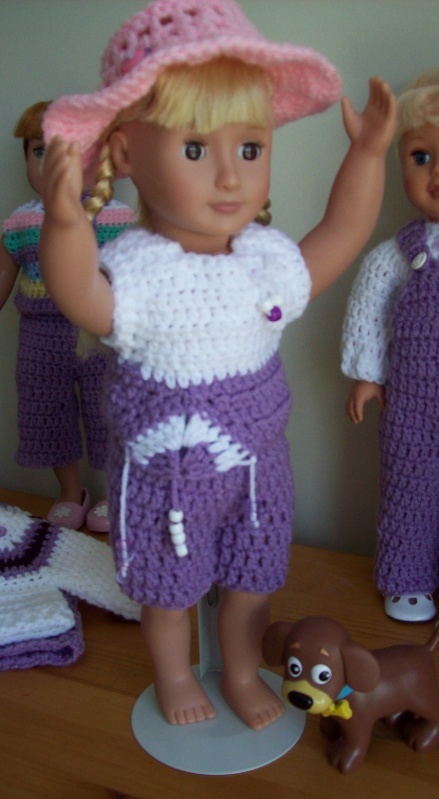 However, I do not permit the selling of my patterns for money. I have once given permission for a booklet to be made of them for a charitable sale and I may do so again *if I am asked* and if it is for a church, charity or school type group. But first you have to ask. Furthermore, If you choose to use my patterns as a money maker, I do not permit my images to be used for any advertizing of your work. You must make your own item and photograph that. These images are as much a part of my Web image as a designer as the patterns are and I reserve that use to myself alone. Hey folks... that was a huge file and with all those pics to place in it , I was really challenged to get it in there and to get things in the right places. If you find mistakes or something doesn't seem right please let me know and I will do what I can to fix it. but no promises... boy what a file to work with. Wow!!!!!! Darski. The outfits are waaaayyyy too darn cute!!!!! 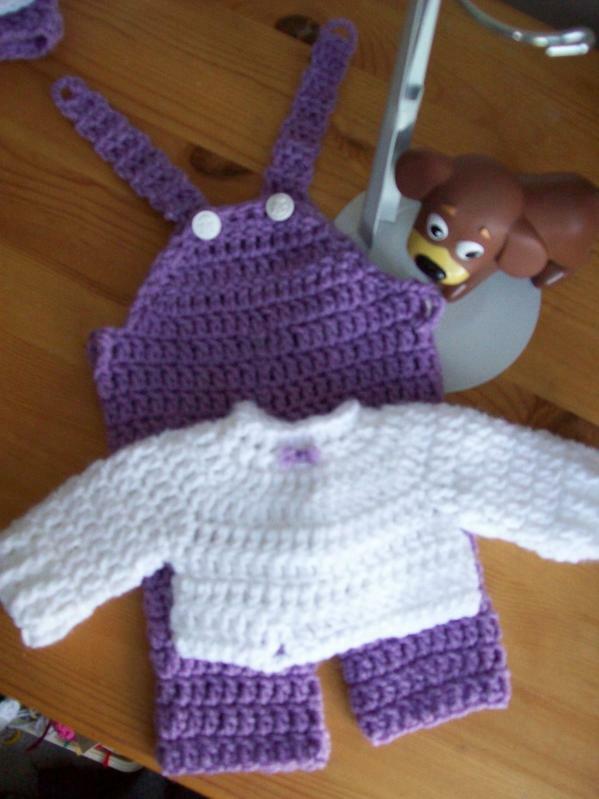 Great Job:cheer Thanx for sharing the pattern. I'm definitely copying it. Very cool. 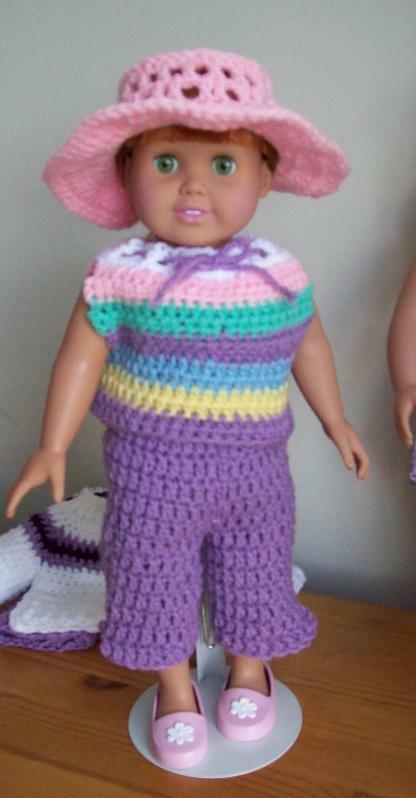 You have to have the best dressed doll around. 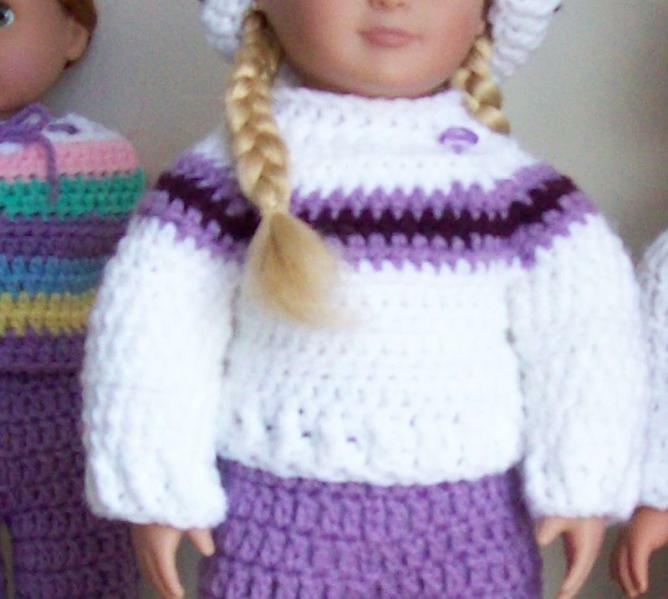 I truley love your patterns for the 18'' dolls. These were especially pretty. 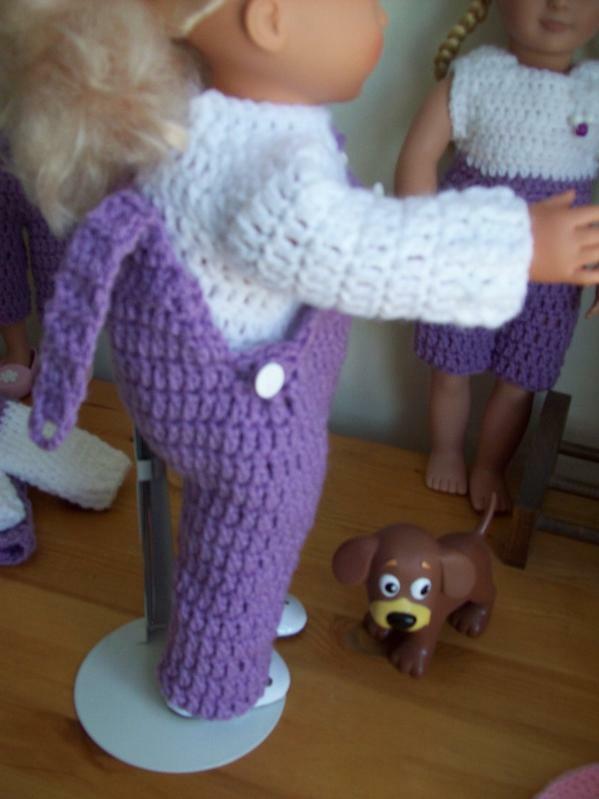 I have made a few and plan to make them all for my neice who loves to just look at her dolls(thank god), she doesn't play with them. Thank you for sharing! Very nice! 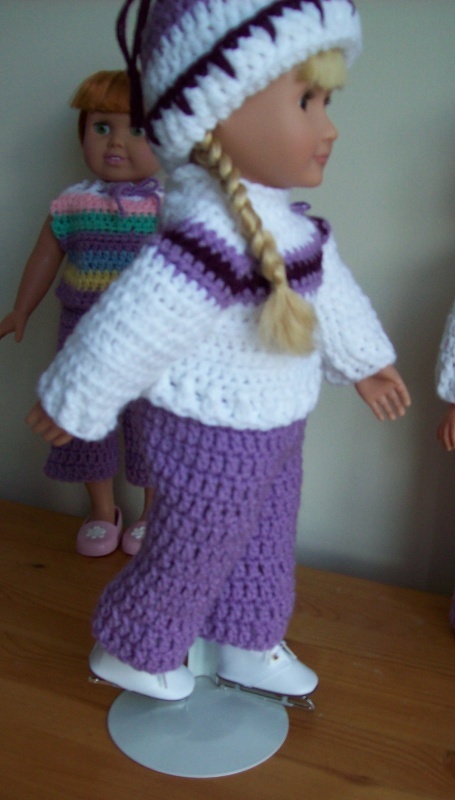 I bought an 18" doll at the local thrift store that I had plans to "recycle" and these would be very nice for her. Thank you. Amazing to say the least.. Very nice! Wow - sweet as can be!!! OH MY GOODNESS!!!!!!!! Darski, when do you sleep, girl? With all of the beautiful outfits you have made lately, I can picture you, red-eyed, and hook smokin' working to bring yet another gorgeous and fun outfit to life! Thank you so much for sharing your gift, and your talent with us. 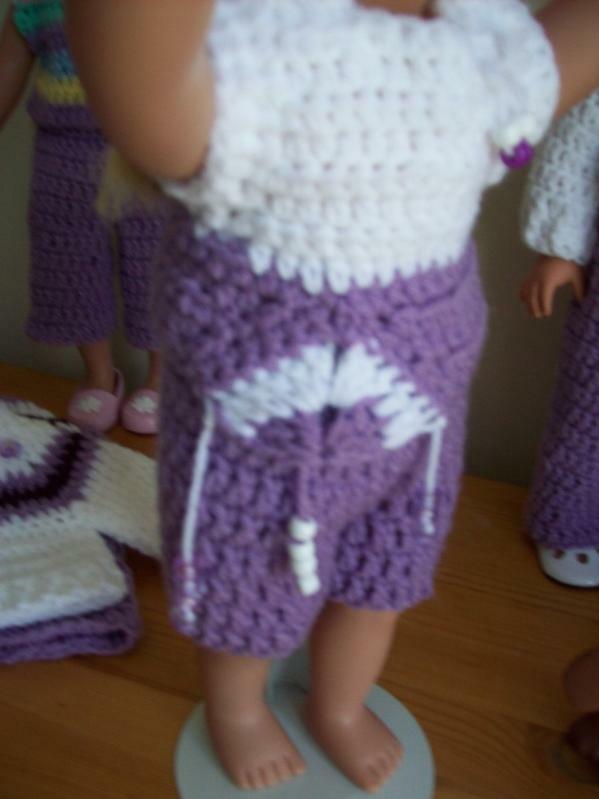 It's what I love about doll clothes... it goes so quickly. Wow Darski!! Amazing (as always)!! 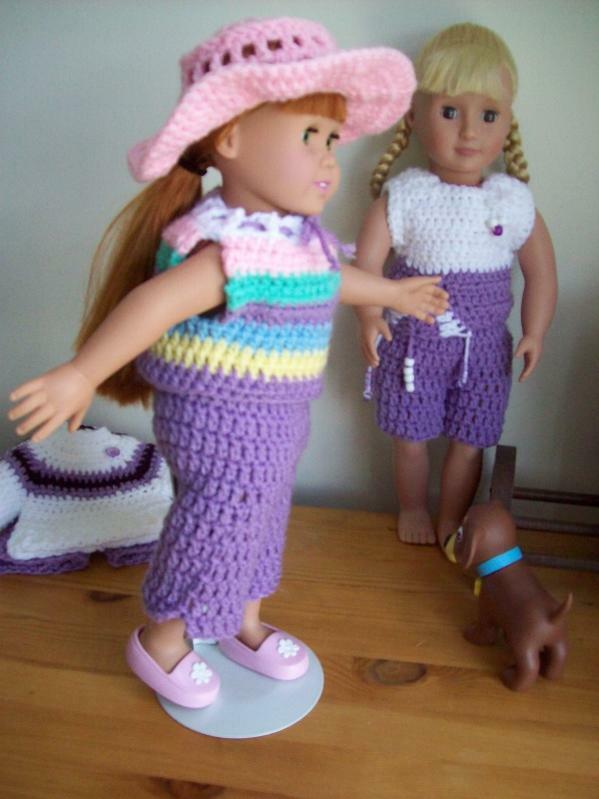 I just wish I had an 18 inch doll to make those sweet outfits for!! Wow! Awesome patterns! Gotta put my printer to work now. Thanks bunches. Cute...very cute !!! Thanks for sharing !!! Darski, what beautiful things you have made, you have quite a talent for crocheting and designing. WOW! Absolutely beautiful. And what a gorgeous choice of colours. Brilliant. Thanks so much for sharing. They are wonderful! And you are so generous to share them with others. Great patterns - love your work and the colours too. Can't wait to try the sun hat ! That is just too cute! Thank you for sharing the patterns!